I was asked a question at the end of the last session that really made me realize what that something was. I was asked “what books can you recommend to help me discover my purpose”. I came to realize that of all the books I read, and all the talks I heard on the importance of finding a purpose or of creating good mission statement for our life, I could never recommend one that is a really great book to actually do it! There are many books that have great information on the concept, such as Resolved, but most of these books only touch upon the concept while the rest of the book would be about other really important ideas. Thankfully there was now an easy answer to the question that was asked of me; PAiLS by Chris Brady. This was a really fun book to read, partly from Chris Brady’s humor, but also because it is short and to the point with everything being discussed. There is so much to take from this book that could help us on our journey to discovering what we should be doing with our lives. Chris goes through a really interesting point at the start of the book, showing what the book is designed to do, and what it answers. He writes about how his mother was given the advice to become a nurse, because she would always have a job. This proved to be true. His mother may have identified with the nurturing and caring aspects of it, but she was rarely excited about the profession overall; probably because of how challenging this profession can be, especially when you have a family. This career seems to require a lot of learning, very long hours, and used to have very low wages (maybe still does for all I know). His mother seemed to like the profession for what it did, but the profession did not actually make her happy. He also writes about some cousins who got very different advice. His cousins were told to do follow their hearts and do what they loved. These cousins got degrees in obscure fields and by necessity lived with low wage menial jobs. “Pursue a career solely for the sake of pragmatism and security” and ” Do what you love, and the money will follow” are equally misleading. While there may be elements of truth and even wisdom in each (more on this later), they are both patently untrue on their face. The real problem is that the two look like different and separate paths. They are not. Like Stephen Covey’s concept of ‘begin with the end in mind’ from his book The 7 Habits of Highly Effective People, this follows the same principle. Everyone always starts at the bottom, which is the learning stage of ‘Preparatory and Preliminary Experience’ . Whatever happens to us stays with us for the rest of our lives, and these experiences are used to fund the next level; Pragmatic Occupation. Whatever we do in the 2nd level is influenced by the first . For example, you need an education to get most jobs. You also might subscribe to a self directed leadership education to get the necessary skill to move up the ranks of your pragmatic occupation. Maybe you’re occupation is a teacher, where a preliminary experience would have been a sport you played with coaches that helped you; showing you how fun it can be to help others become better. Everything that happens to you, no matter how insignificant can be a preliminary experience for something. *** Note that with everything that happens to you counting, realize that we are not immortal and only have so much time. This is why it is so important to make sure we are doing the right things with the time we have, as we can only fit so many preliminary experiences into our life. An Occupation could even be a preparatory experience for a future occupation. For example, I believe my time as a manager of a Tim Hortons helped me learn what I needed in order to move into management at a movie theater I later worked at. The real problem is that for so many people, their ziggurat ends at the occupation level. For people to truly be happy, to be living the life they really want, they need to move up to the next stages of passion and purpose. I believe that most people are not happy because they haven’t found what their passion is, or have not found purpose for their life to work towards. If occupation and paying the bills was enough, why would so many actors and musicians with all their money be committing suicide, or getting into trouble with drugs and going into rehab? 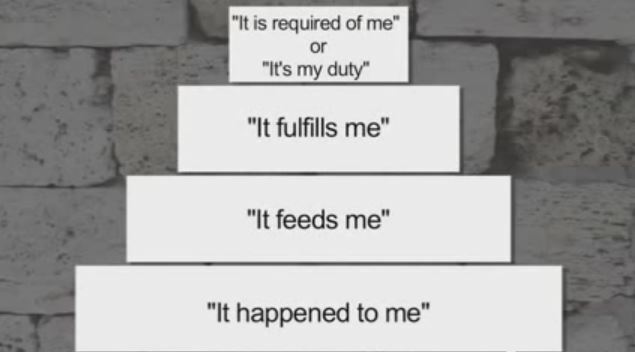 Living your purpose is much easier when we first figure out what belongs at the top of your life’s ziggurat, and finding out what needs to be done at the level below so that you will actually be doing what needs to be done; to be doing what you feel you should be doing. Once you have an idea of this, find out what you’re passionate about, and which of these might lead to you doing that which you should be doing. 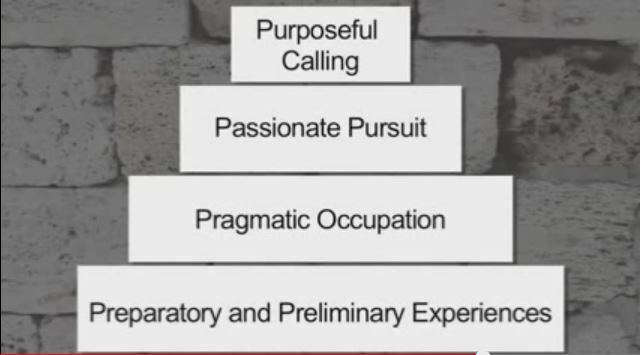 When you have defined what your passionate about, ask yourself what you should be doing in the pragmatic occupation level that will allow you to pursue those passions. What education or what experiences should you pursue that will get you the occupation you need to do what you are passionate about? Chris Brady’s PAiLS is an amazing and fun manual on how to start doing just that. As Chris Brady writes in the book, “There is another incorrect motivational phrase … it’s the one that says, “it’s never too late.” There most certainly is a “too late.” There always is. It’s just not yet. It’s not too late yet. There are many stories I have about this book. I think for anyone in their 40’s looking for meaning and purpose this book helps in that narrow path. I recommend it to all as a builder of vision for your purpose. I thank Chris Brady for intentional excellence for us, the seekers, the purpose driven….to have fodder on our Journey.